Kassym-Jomart Tokayev took the oath of office and assumed the post of Kazakhstan’s interim president on Wednesday after the nation's long-time leader Nursultan Nazarbayev announced his resignation. 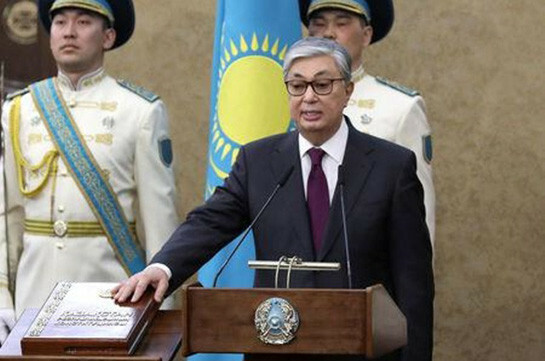 "I solemnly swear to faithfully serve the people of Kazakhstan, to strictly observe the Constitution and the laws of the Republic of Kazakhstan, to guarantee the rights and freedoms of citizens, to fulfill in good faith great duties of the president of the Republic of Kazakhstan entrusted on me," Tokayev told a joint meeting of the parliament’s houses. Tokayev, 65, has served as Speaker of Kazakhstan’s upper house of parliament, the Senate, since September 2017. After the ceremony ended, Chairman of the Central Election Commission Berik Mazhitovich handed over to Tokayev the president’s identification document. Kazakhstan’s first president Nursultan Nazarbayev, 78, announced his surprise resignation on Tuesday after 30 years in power. He will remain Chairman of the Security Council, the Nur Otan Democratic People’s Party and a member of the Constitutional Council. Tokayev will serve for the rest of Nazarbayev’s term, which expires in April 2020.